You&#x2019;ve heard of the scheme. Now comes the man behind it. 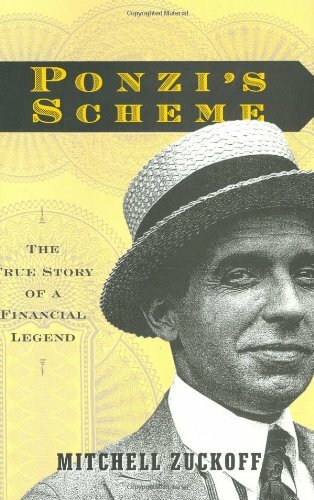 In Mitchell Zuckoff's exhilarating book, the first nonfiction account of Charles Ponzi, we meet the charismatic rogue who launched the most famous and extraordinary scam in the annals of American finance.<b><br /></b><br />It was a time when anything seemed possible&#x2013;instant wealth, glittering fame, fabulous luxury&#x2013;and for a run of magical weeks in the spring and summer of 1920, Charles Ponzi made it all come true. Promising to double investors&#x2019; money in three months, the dapper, charming Ponzi raised the &#x201c;rob Peter to pay Paul&#x201d; scam to an art form and raked in millions at his office in downtown Boston. Ponzi&#x2019;s Scheme is the amazing true story of the irresistible scoundrel who launched the most successful scheme of financial alchemy in modern history&#x2013;and uttered the first roar of the Roaring Twenties.<br /><br />Ponzi may have been a charlatan, but he was also a wonderfully likable man. His intentions were noble, his manners impeccable, his sales pitch enchanting. Born to a genteel Italian family, he immigrated to the United States with big dreams but no money. Only after he became hopelessly enamored of a stenographer named Rose Gnecco and persuaded her to marry him did Ponzi light on the means to make his dreams come true. His true motive was not greed but love.<br /><br />With rich narrative skill, Mitchell Zuckoff conjures up the feverish atmosphere of Boston during the weeks when Ponzi&#x2019;s bubble grew bigger and bigger. At the peak of his success, Ponzi was taking in more than $2 million a week. And then his house of cards came crashing down&#x2013;thanks in large part to the relentless investigative reporting of Richard Grozier&#x2019;s Boston Post<i>.</i> <br /><br />In Zuckoff's hands, Ponzi is no mere swindler; instead he is appealing and magnetic, a colorful and poignant figure, someone who struggled his whole life to attain great wealth and who sincerely believed&#x2013;to the very end&#x2013;that he could have made good on his investment promises if only he&#x2019;d had enough time. <i>Ponzi</i> is a classic American tale of immigrant life and the dream of success, and the unexpectedly moving story of a man who&#x2013;for a fleeting, illusory moment&#x2013;attained it all. MITCHELL ZUCKOFF is a professor of journalism at Boston University. He is co-author of Judgment Ridge,<i> </i>which was a finalist for an Edgar Award, and author of Choosing Naia, a Boston Globe bestseller and winner of the Christopher Award. As a reporter with The Boston Globe, he was a Pulitzer Prize finalist and winner of numerous national honors, including the 2000 Distinguished Writing Award from the American Society of Newspaper Editors. He lives outside Boston with his wife and two daughters.